Boneface. The Juice. A Dry Hopped Gose. I like Gose. Just in case you read somewhere that I didn’t, when in fact it is sour beers I’m not a big fan of, yet and I always seemed to be drinking them in one kind or another. I reluctantly brought this, since they make four beers, of which I brought three, then cunningly and clumsily I dropped one, and just ‘had’ to replace it, and buying a single beers seems somewhat sad. So all in I bought two, making the complete set. This 500ml bottle is 4.5% ABV which is about 135 calories a serve size. This is 1.9 standard drinks worth of things. The Juice has a lot going on. A dry hopped Gose, sour wheat ale in a German style, brewed with salt. A mouthful to describe, but the unique processes add a clean tart taste, making the juice a surprising mouthful of joy. Dry hopping and Gose’s don’t normally go hand-in-hand, as dry hopping is often reserved for ales to provide aroma and Gose’s are known for tart, briny light beers. However, Boneface have achieved the best of both worlds by dry hopping this tart beer. Aromas of fresh cut grass (dry hopping) are off-set by salty citrus. 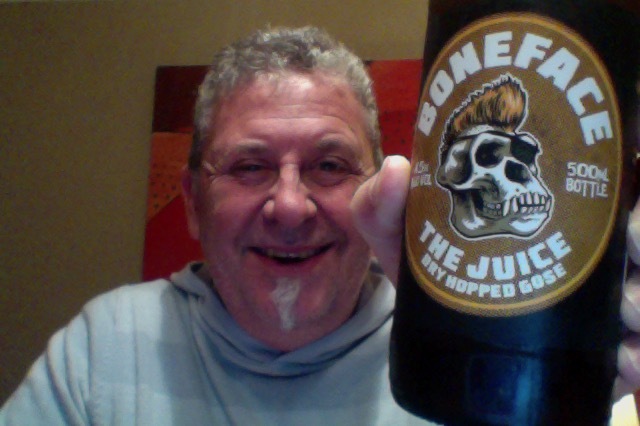 Maaaaate … that’s the aroma of an IPA or Pale ale, a hopped beer, not a germanic lager type thing, this isn’t proper! Pour is pale yellow, cloudy with a white cloud fluff of head that seems to want to sit happily on the top there. It’s very much paler than I thought it might be. That’s two things that I’ve been confused by. Continuing with that hoppy aroma in the glass, that’s not supposed to be there, and before I drink I have this expectation…..
That’s a peculiar experience of beer, that gives you this hopped up nose on opening and then completely not that on drinking with sourness, saltiness, tanginess, tartness, citrus twists. My oh my. Such easy and enjoyable drinking, a beer that avers more towards sour than anything but it is very interesting and very drinkable. I’m not sure though that you could drink a lot of it, and the one would be more than enough to set you up for something else. The Salt thing, genuinely I don’t get that in this, then again, as I have often said I’m no expert in these things. I am pretty certain though that this was clever and engaging stuff. Where did I get it? Fine Wine Delivery but you should find it in good places. Am I enjoying it? Yes, it’s a party. Would I have another? Not two in a row, but I would have this again, sure. Would I share with a friend on a porch and set the world to rights? It’s nice beer, hoppy confusion and citrus tart sour beer on the tongue, I might get the blindfold out and do a blind tasting, something I think I’m also confused about. Nope. Not gonna do it. Had one Gose in my lifetime. Never gonna have another. The one I had was from Sierra Nevada — one of the grand-daddies of the craft beer movement. I had hopes for it as a result. I took two sips and threw the rest of it out. There are still several bottles of it in my garage, months later, and I don’t plan on drinking them. Sour fizzy water … that about gets it right. Some people get suckered in so-and-so is doing ‘the something’ and because you have a fear of missing out you can get pulled along. I liked this to the mars bar episode in Seinfeld where they started eating them with knife and fork… A lot of brewers went all in and continue to produce soured beer, because the beards like it and the sheep think they’re what they should be drinking. I feel sheepish every time I have one. My son got the Gose and brought it home. I’m pretty certain sour beers will be a short term fad. There is so much experimentation going on. A lot of it good. I don’t know very many people who are fans of the Gose. 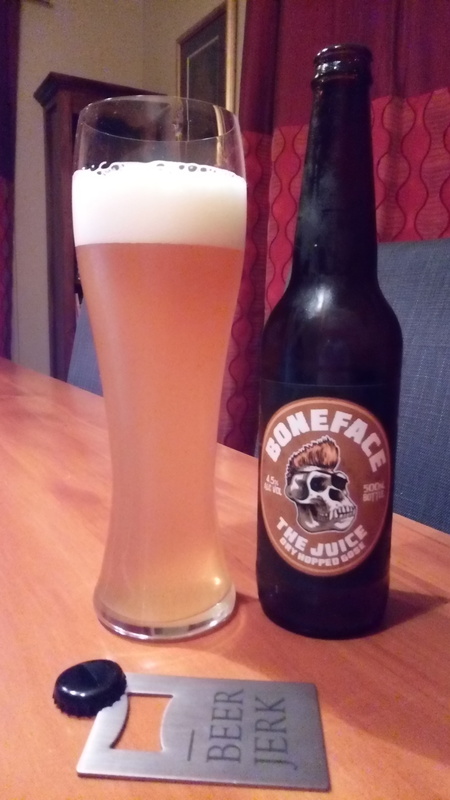 This entry was posted on June 3, 2017 by Philip Walter in Beer, Beer of New Zealand, Beer Review, BoneFace, Craft Beer, Critic, Grodziskie/Gose/Lichtenhainer and tagged Alcohol by volume, Beer Review, BoneFace, Boneface The Juice Dry Hopped Gose, craft beer, Sour beer, Wellington.